Age of neighborhood: the selection should be areas that have developed over a long period. It is an assessment of the process of change, and not a snapshot of one instant; newly completed neighborhoods, or new squatter settlement which would show little on how people make expansion decisions. Stages of expansion; every neighborhood shows a range of improvements, from those that were very successful to those that have not managed to progress beyond a basis beginning. The number to survey is more difficult to determine. Statistical rigour is not necessary. We have been doing 3 cases per neighborhood as a start, and sometime seven when responses are still not clear. A word about terminology: settlements, communities, neighborhoods are common descriptors. We will use settlements to highlight the physical pattern. Expanded units in former Site and Services projects. These projects were developed in the late 70s and 80s, and continued to some degree until now. The World Bank did many, along with other development agencies and it is useful to compare the initial starter core house that was provided (these varied: sometimes only utility connection, sometimes a room+bath/kitchen area, sometimes a small house.) with the continued expansion. Both core house and layout were formally designed. What were the triggers or catalyst for expanding? How did they do it? Include drawings of original core house design/starter house/ or initial provision as a reference for changes. These areas have been undergone improvement through formal programs by the city, often with funding by development agencies. House loans, infrastructure provision, streets, drainage are common program components. An interesting comparison would be previous squatters who have improved themselves over time and the formally targeted settlements with specific upgrading measures. Houses that are not part of a larger homogenous area of informally or formally developed area. Focus is on older, more established houses. The interest is to document expansion over the long term, in particular to understand the ‘triggers, the catalysts’ for expansion and how did they do it. Examples from relatively recent projects may not offer sufficient change to warrant documentation. Select older, longer established projects. Any incrementally developed neighborhoods is considered to include three fundamental expansion stages: very successful, successful, and little change. All three are found despite all starting at approximately the same date. The survey should include all three as a point of reference. A useful indicator is the height of the dwelling. Three or more stories shows is the assumed measurement of success. Important is to consider the location: they tend to be on very active bigger streets, on street corners. Is expansion related to the better economic opportunities offered by the location, i.e., ability to open a store, etc. to cater to the activity? A single story - sometimes two - but obvious good quality construction, well taken care of house and outside. Little or no expansion from original start. If starting from a core house, the owner managed to only complete a rudimentary enclosure to meet basic needs. In some squatter areas which started from a very low level, only completion of a basic enclosure for security and rain and sun protection. 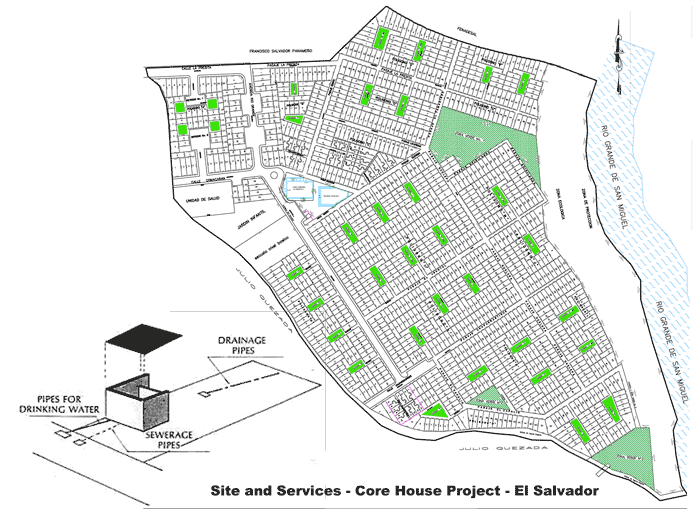 Examples are from El Salvador in a formal site and services project, 2008. The goal as this point is to get a sense of general trends, albeit the confidence level may be low. Statistical rigour is not necessary. Generally a minimum of 3 per neighborhood, and sometimes up to 7 till a general pattern emerged.